Hi everyone – Well after last weeks really successful curry night (and a big thank you again to everyone who cooked/donated a curry – they were magnificent), tomorrow night we will be having Piccolino pizza and sausages. Whilst it will be warm, (please make sure your child has water, a hat and sunscreen applied), it will be a fantastic night after matches, training and Junior Blasters. A reminder that Friday 21 December is our Christmas Party (invite attached). 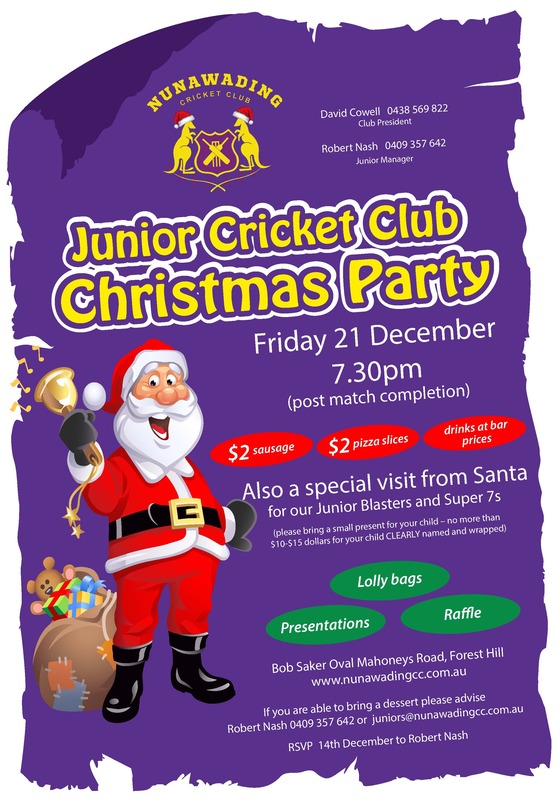 Santa will be arriving during the Junior Blasters and Super 7s training. If you would like your child to receive a present, please purchase one before hand – and bring it along on the night – clearly named. There will be a dedicated spot for you to leave your present. If you would like you’re a sibling to also receive a present, that is also fine. Unfortunately, Santa will have to leave before our U12, U14, U16 and U18 finish their matches. As per previous weeks, we are running another Bunnings BBQ on Boxing Day. This is a great way to fundraise from those outside the club. Currently the roster only has 4 names on it (across our senior and junior club). With over 250 players, I am sure we can get an additional 12 people. I know many families are away, however if you are still in Melbourne – and can offer two hours, please let me know, or write your name on the roster in our club rooms. A number of our juniors have been spending the last few weeks, trialing for representative cricket. I hope to have a full name of those who have been successful before Christmas (if your child has been successful, please let me know – as clubs are not advised). Please click on the link or photo below and it will take you to Field of View Photography order page where you need to click on the photo option you wish to purchase. After last weekends terrible weather, tomorrow night looks ideal for cricket and curry!! Tomorrow Night is curry Night. Thanks to those families who have donated a curry – it looks like we are all in for a great feed!! If you are going to make a curry – and have not let me know, can you please do so. At this stage – based on what I have been advised – a few more would be great!! Curry Night really is an awesome night – where our rooms are generally full, with everyone enjoying each other’s company. A reminder as to how it works – is that all curries/rice/noodles are available for all to share. If you donate a curry, there is no charge. If not, we simply ask for $5 a plate. We also have sausage sizzle for those who may not be so keen on a spicy meal. Friday 21 December, will be our Christmas Party. I understand that despite a busy schedule, Santa will be arriving for our younger Juniors. Unfortunately, he will need to leave before our older Juniors matches finishes!! Further details on this next week, however if you are a parent of a Junior Blaster or Super 7, Santa will be arriving during your session/training. If you would like Santa to hand out a present to your child, you will need to buy one and bring it on the night – clearly named. As a guide, the present should be no more than $10-$15. If anyone has any financial concerns with this, please let me know confidentiality, and we will work something out. The Association has just advised that all Junior matches have been cancelled tonight due to the rain and unsafe conditions for cricket. Additionally, we have cancelled Super 7s training and Junior Blasters tonight for the same reasons. On saying that, our Club Rooms will be open from 5.00pm. We will be cooking up Super Burgers, Vegie Burgers and sausages – and the bar will be open. I have had a number of families indicate they are keen to come, so please come and enjoy!! Could all Team Managers/Coaches, please relay this message to your families. Yes, the weather looks ordinary tomorrow night – however a message for everyone – matches, training and Junior Blasters will proceed – unless you are notified by your Coach/Team Manager/Junior Blaster Co-ordinator – or myself. All players are expected to attend, unless notified previously. Please keep an eye on email, as that is our primary form of communication. We do have Super Burgers and sausages planned for tomorrow night, so if play does commence, then please come back for a feed – saves you cooking at home, or buying take away!!!!! Our Curry night is just ONE week away. Thanks so much to the ten families who have offered to cook and donate a curry. If you can contribute, now is the time to please yell out – and let me know!!!!! We will also have sausage sizzle for those who may not be so keen on a spicy meal. Ths is a great night – that everyone always enjoys!!!!! Max Zero Band Night and Bunnings Sausage sizzle. Thanks to all the families who attended and supported these events. Saturday night at the club rocked!! The club also made a PROFIT of $1,270 from the Bunnings sausage sizzle. We are running another Bunnings BBQ on Boxing Day. Please if you can help cook some snags – and more importantly have some fun working with other Nuna people on the sausage sizzle, please let me know or write your name on the roster. These are on their way!! Despite last weeks message, your children memberships for both teams will now be sent to me – and I will distribute. Please keep an eye on your email though for updates from the clubs you have chosen!! Hi everyone – after a weekend off, Junior Cricket returns this weekend!! Tomorrow night post match, we will be having Roast Chicken, together with salads. We will also have sausages and vegie burgers. It will be great to see as many families as possible upstairs to hear how our children performed. A serious and important message. Whilst at Nunawading, we will always do all we can to ensure the safety of your children, our expectation is that parents are responsible for their children at all times. All sports carry risks of injury, and when using a hard ball, there are additional risks at play. The Club expects that’s parents will be at games and training, not just from a responsibility perspective, but also from an enjoyment perspective. Where this is not possible, the club expects that a family will ensure another parent is responsible for their child on that day/night. Our Coaches are volunteer parents – who have given up their time to help all. Something we are very grateful for. With that in mind, if an injury does occur, and a parent is not there – outside of applying a band aid or some ice – our coaches will always err on the side of caution – and most likely call an ambulance. It is for this very reason that it is preferred that a parent is at the ground – being responsible for their own child. The Club does understand that this is not always practical, however there have been a number of situations this season, where families have dropped their children off – and have not returned to collect their child until 30+ minutes after the completion of a game. This is unfair on our coaches, who then try to contact parents and have to stay with your child. Again – I don’t want this to sound like a negative message – more so an important one – to ensure the safety of your child and the enjoyment for them. If this creates an issue for anyone, please let me know. 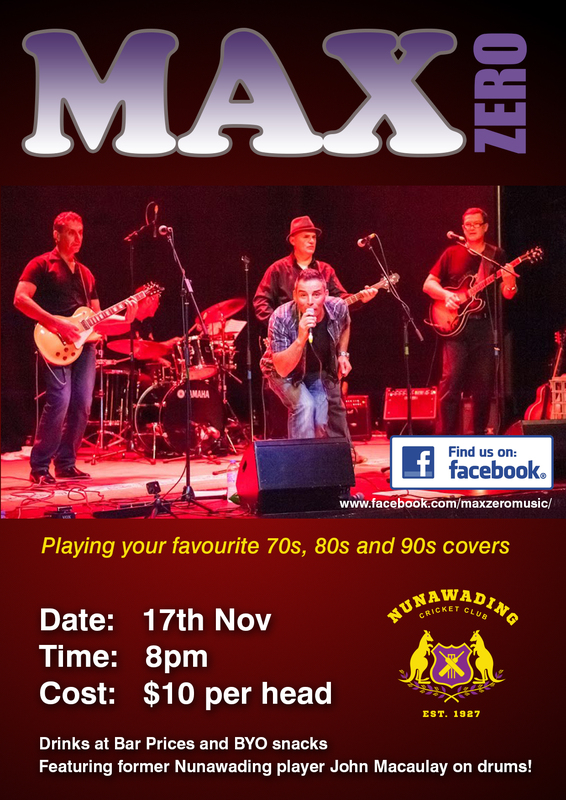 On Saturday 17 November, ‘Max Zero’ will be performing at Nunawading – playing your favorite 70s, 80s and 90s songs!! Entry is only $10 per person, with drinks at Bar Prices. Further information attached – but this will be a great fun night!! All junior parents welcome to attend. (If you are planning on attending, please also just let me know). A reminder that Curry Night is on Friday 30 November – only three weeks away. The way it works is that we ask families (who can) to make a curry/rice/noodle dish and bring them along to the club for our Post Match gathering. All the curries and rice dishes are then available for everyone to try. If you donate a curry, there is no charge. If not, we simply ask for $5 a plate. We also have sausage sizzle for those who may not be so keen on a spicy meal. If you can cook/donate a curry, please let me know. As mentioned last week, Nunawading Cricket Club has been selected to participate in the Grill’d (Burwood One Store – Corner of Burwood Hwy and Blackburn Rd) Local Matters in the month of November. There are three ‘jars’ in store – one for three different Community organisatioons (In November, Nunawading is one of them). When you buy a burger, you receive a token – which you then choose which jar to put in. At the end of the month, each Local Community Group receives some money from Grill’d (depending who has the most tokens in their jar!! Therefore, please if you are feeling hungry, pop into Grill’d for some great burgers – and help Nuna receive some money! A reminder there are still spots available to help out on the roster for upcoming Bunnings BBQs at Vermont South, namely Sunday 18 November 2018 and (Boxing Day) 26 December 2018. We have placed rosters in the club rooms for two hour shifts. If you can assist, please write your name down on the roster tomorrow night (or let me know). I am writing to let you all know (very early) that at the end of this season our Junior Manager Robert Nash will be stepping down after 6 years at the helm. We are looking for someone to step up and take over this role while Rob is still around, so he can help guide them through what is required. Rob is not running away and will be able to offer advice to the new person/s – while still allowing the new person to put their own unique ideas into the role – to continually build the club. Rob is very happy to be a backup as needed. If you are even remotely interested in this role, please feel free to speak to myself or Rob. Rob has detailed information of what is required and when and will be happy to speak to you.